Tracy Abrahams : Quick Little Note Cards using Watercolor WIngs by Stampin' Up! Quick Little Note Cards using Watercolor WIngs by Stampin' Up! 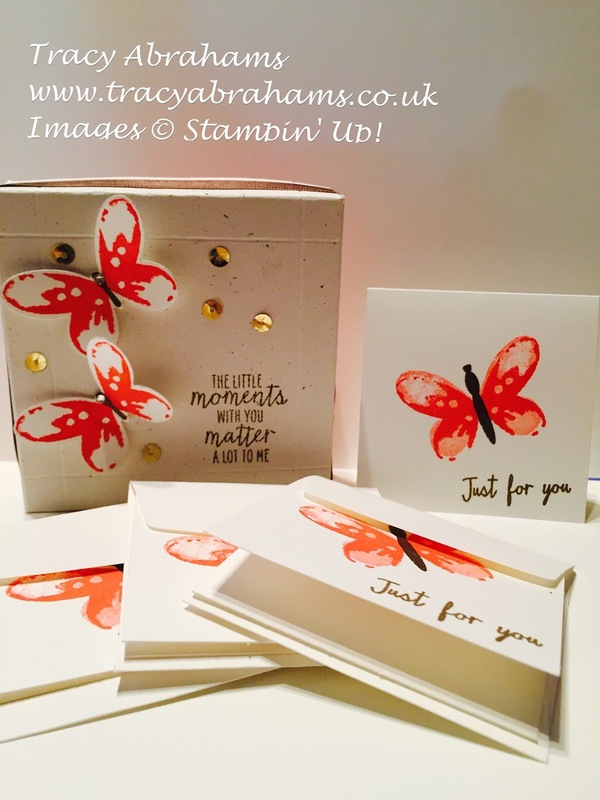 It's been a busy time in my house with the summer holidays and I wanted something super quick and colourful for a special friend so I reached for a great set called Watercolor Wings by Stampin' Up! I first made a little box so I had something to put the note cards in by cutting a piece of Watermelon Wonder 6" x 6" and scoring at 1" on the Simple Scored Scoring Plate all the way round. I then cut Very Vanilla 6" x 6" and scored slightly under 1" all the way round. When you have scored and burnished both pieces you cut down the little tabs at the 4 corners and fold them in using snail tape and secure them in place to make the box. The butterflies on the top of the box were done with Whisper White as the base and stamped with Watermelon Wonder ink then cut out with the Butterflies Thinlits. The Little cards are 6" x 3" in Whisper White and are scored and folded in half. The sentiments on the box and the little cards are in the Watercolor Wings set and are so cute. I stamped the butterfly on the cards in Watercolor Wonder and Calypso Coral with Chocolate Chip for the body. I hope you like them I think they look cute and I'm sure my friend will love them. I have added all the supplies I used to make this card. Please remember to use my monthly Hostess code of JSPDPQBV if you make a purchase of over £20 as I'd love to send you a FREE thank you gift and card at the end of the month. Please also tick the "I would like contact" so I have your address to send the gift to. I will only contact you again if you are happy to have updates and information about special offers.